Who will be the Pixar of AR? Someone oughta be rounding up Hollywood special effects engineers and animated character designers to build an augmented reality content startup. This week’s launch of Facebook’s Camera Effects platform means there are suddenly 1.8 billion people waiting to be entertained by digital overlays on the real world. And now, startups won’t have to grow a user base from scratch, make people recreate their social graph, establish a place to share the content they capture or develop much of the underlying object recognition and spatial perception technology. All they have to do is build things that amuse people with the magic of visualized imagination. Facebook is desperate to prove there are killer AR experiences out there, so there’s plenty of opportunity to be featured on the platform. Whoever establishes themselves as capable of commanding people’s attention with this new medium will have businesses throwing money at them to build branded AR experiences — like how BuzzFeed monetizes through its BuzzFeed Motion Pictures ad creative team. And since everything that happens in Facebook AR happens “on camera,” it’s instantly shareable with a massive social network. AR will become part of the new social media storytelling vocabulary, offering viral growth for developers. Experts in the field tell me there are no standout AR content startups. That seems like a lucrative gap to fill. There are already a bunch of startups like Penrose, Baobab and Within vying to be the Pixar of VR. Several have raised tens of millions of dollars. And that’s despite the fact that most people don’t own a VR headset, and, if they do, it’s probably gathering dust somewhere. The main point Mark Zuckerberg tried to get across in his Facebook F8 conference keynote was that we don’t need to wait for augmented reality glasses. There’s already an AR device with near ubiquitous market penetration: the smartphone camera. Yet because the physical world is so big, blanketing it in AR experiences may necessitate leaning on an army of outside developers — whom Facebook has historically embraced, but Snapchat has shunned. When any new communication medium hits massive audience scale, there’s a chance for new players to break into the entertainment space. It happened with radio, film, TV, web video, mobile apps and VR. Pixar saw computer-rendered animation’s promise, seized on it early and grew into a hugely successful business. Now AR is coming of age. It has different fundamental properties than past mediums, so the winners won’t necessarily look anything like Pixar in terms of organizational structure or business model. They might look more like Flappy Bird developer dotGears, or YouTube channel owner Maker Studios. There’s sure to be function-focused AR utilities and full-fledged games that spring up. Some might require people to download separate apps, and therefore might need to wait until more people are comfortable with AR and confident about its value. But Facebook’s Camera Effects platform and AR Studio tool mean there’s a powerful, viral distribution channel for lightweight experiences that can live inside Facebook’s apps. Imagine a startup that makes a cute and loveable augmented reality character that performs comedy whenever your phone recognizes you’re in a different place or around different objects. In my head I see Chris Farley turned into a panda that pulls off a silly slapstick humor routine with whatever else is in frame. Or a startup could index the world’s landmarks and build mini-games or artistic effects triggered by each of them, creating a world-wide scavenger hunt. Every tourist is going to ask what the person next to them is doing laughing while they point their phone at the Eiffel Tower or Statue of Liberty. They’ll discover they already have the app. 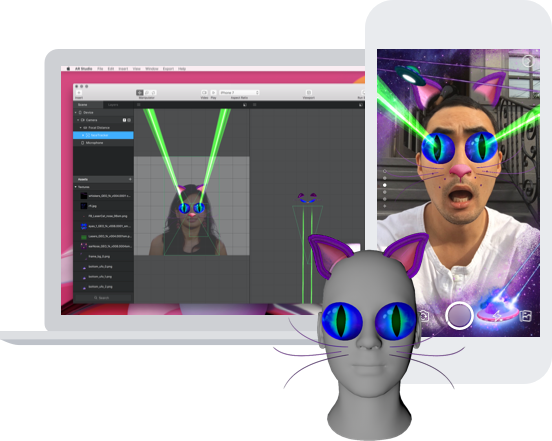 While the AR Studio development tool Facebook built does seem remarkably easy to use, this content development will require funding. Some intrepid venture capitalists might be wise to take a few swings at ex-Disney or DreamWorks employees building AR startups. Or Facebook should seed the AR developer ecosystem by providing up-front payouts for exclusive content, much the way it did to get Facebook Live video off the ground by paying top news publishers. The most exciting part is no one really knows the potential of a consumer AR platform. We’re literally on day four, and new mediums are few and far between. What’s your idea?